Low profile, low noise fan. Produces a linear air flow movement over the surface of the water, accelerating the evaporation process and thus achieving a cooling of the water (1.8° to 3.6° F) on 500 liters (132 US gal.) in standard aquariums. Low 5V power supply unit. 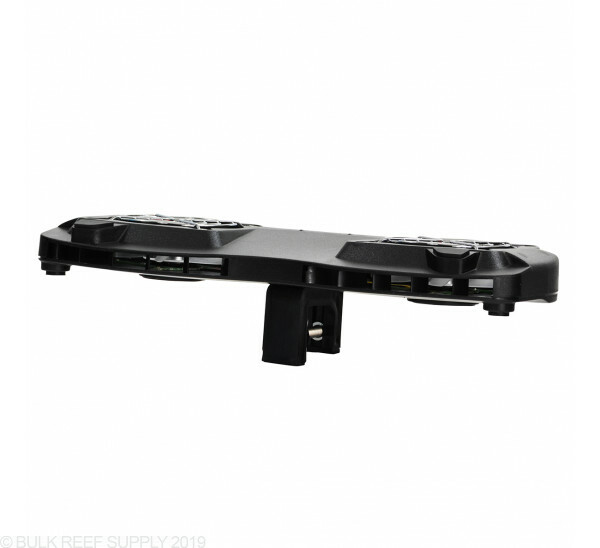 Attachment included which can be used for every aquarium edge up to 25 mm (.98 in.). Went thru heatwave and needed fan 24/7 for a couple of days. Requirement proved to be to much for this fan and it stop working. Problem okay for minimal use. I had three of these fans in the past 2.5 years. 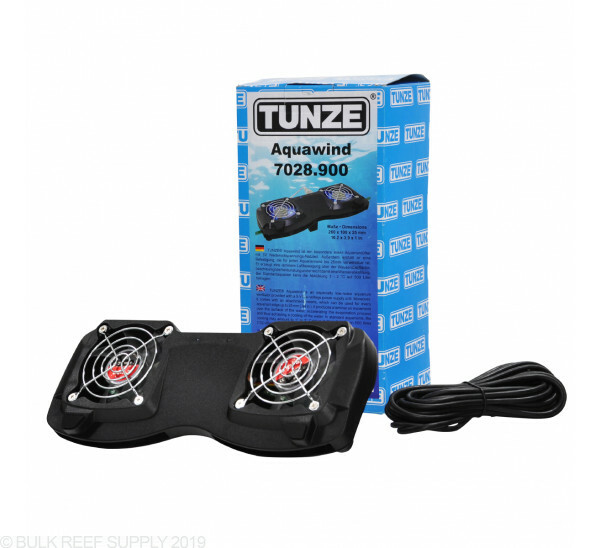 The fan fails quickly, but I keep buying them because they look so good (discreet) on my aquarium, plus the fan does a great job of cooling the aquarium. The fan appears to be very susceptible to salt air damage. I've looked all around for something similar to try, but no luck. I've had mine for over a year and it's still doing a good job of keeping the tank (120 gallons) 4-5 degrees cooler, though it is a little louder than I expected The fan sits on a ledge on the back of my tank and it's low profile definitely makes it discreet. The metal screens on the top of the fan have gotten a little rusty, but no big deal. The fan is pricey, but beauty doesn't come cheap! Even with half of the top cover with glass, this fan on low speed setting dropped the temp by 8 degrees. Nice job. I like the low profile design. We shall see how long it lasts. The fan was quiet and reliable. Unfortunately with a short lifespan. Noticed rust on the fan within four months. The only thing that works currently is a blue light and/or red light both fans seized up. I'm definitely not impressed especially considering what I paid for it. It cracks me up with some of these totally incorrect reviews. 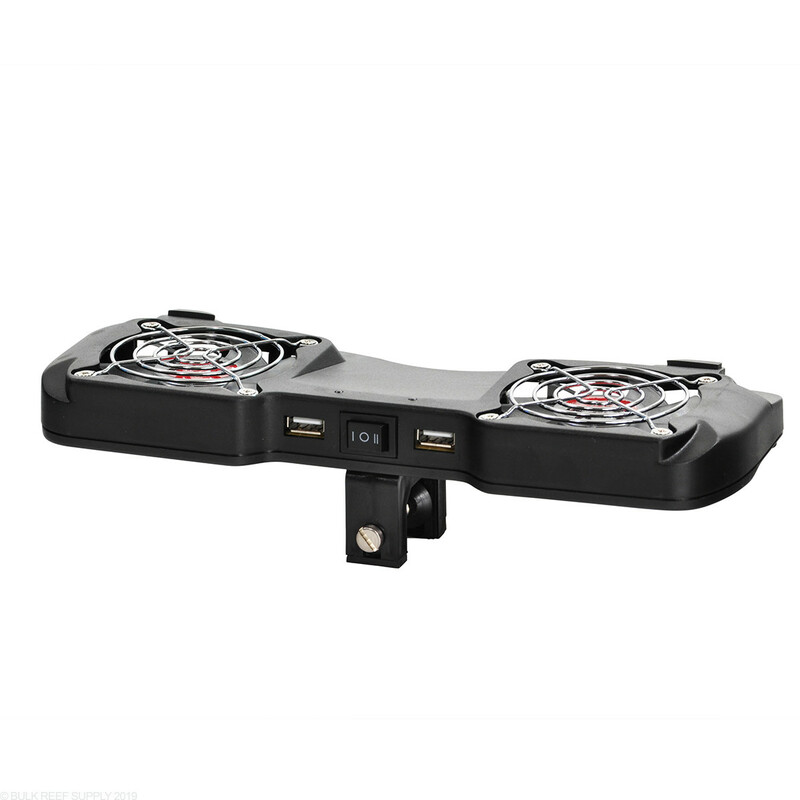 This fan will help with your temp from not increasing and it has personally has dropped my temp level 1-2 degrees on my 120.. Also, very quite.. 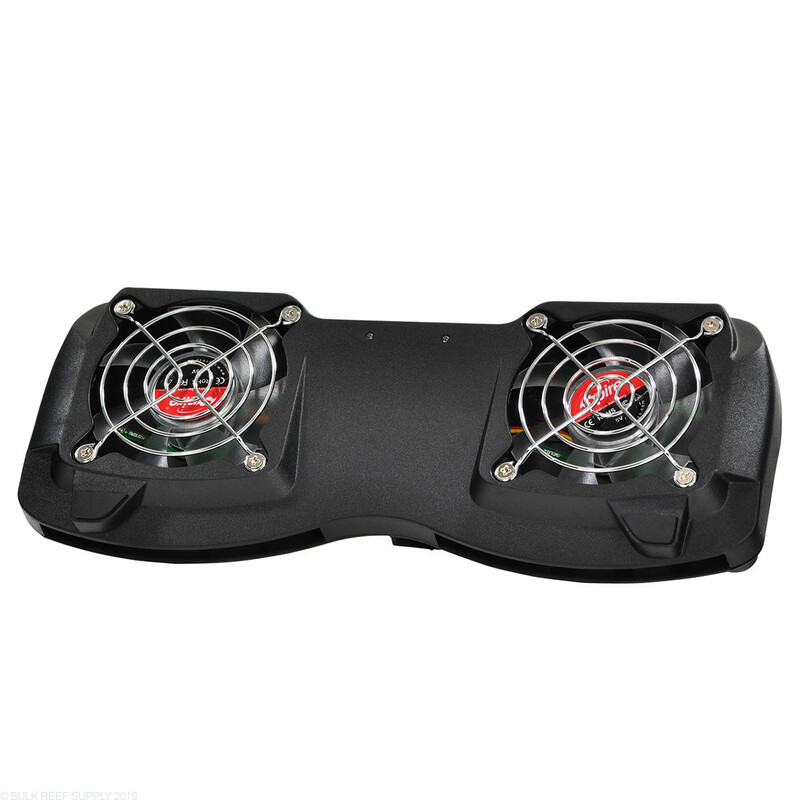 I like them so much I just bought another one for my other tank.. FYI, feel free to go out and but a cheap Fan King and you will have major evaporation issues when using that type of fan.. I bought this back in June, to help cool the tank over the summer. Before this I was using a cheapie Wal mart clip on fan so for the price of this I was hoping for more. The air flow isn't all that great, the clip on fan moved way more. The metal on this is already rusted, to the point that I don't think I can use it again next year. 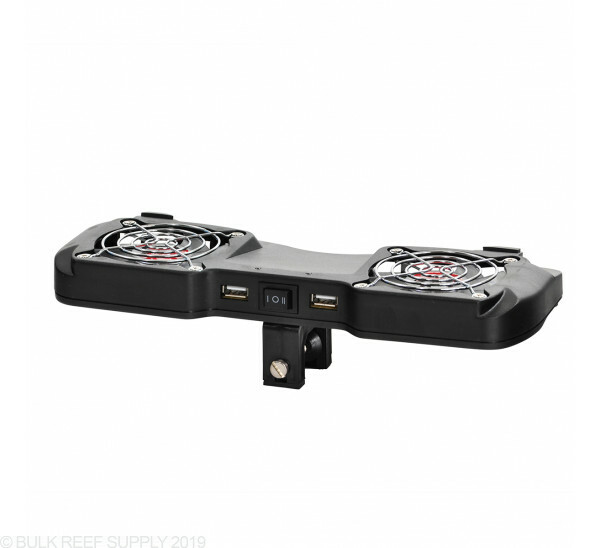 I had both fans up and running with this set to go on at a lower temp and whenever the temp of the tank would rise this would go on first and it couldn't keep the tank cool, the second fan would always click on and get the job done. Don't waste your money on this. 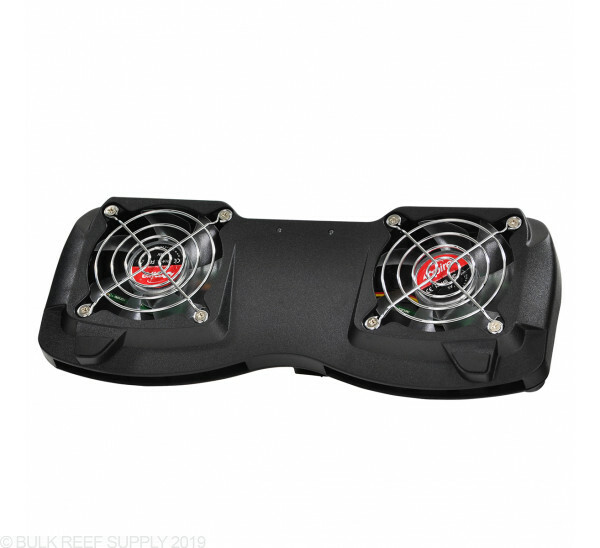 I have three of these fans mounted on the back of my 90 gal reef tank controlled by my Neptune Apex. They look cool and do reduce the water temp at least 2-3 degrees. But the shiny grill on the top of every fan is rusting after less than six months of operation.I won't replace unless/until they replace the current grill with a non rusting substance. I really like this fan. I've had it for a few months and it seems to do the trick. It looks good and is quiet. I have it plugged in with my Apex and it kicks on when it needs to and I see the temp drop. Mediocre air flow, extremely expensive. Funny how Tunze claims this will reduce temp in 1-2F in a tank(any size for that matter). A small $10 fan would do better pointed to the water of the tank. It looks fancy, and that is all you get from it. It sits too high up and doesn't fit on a standard rim. Furthermore,they're simply basic computer fans. Definitely overpriced. 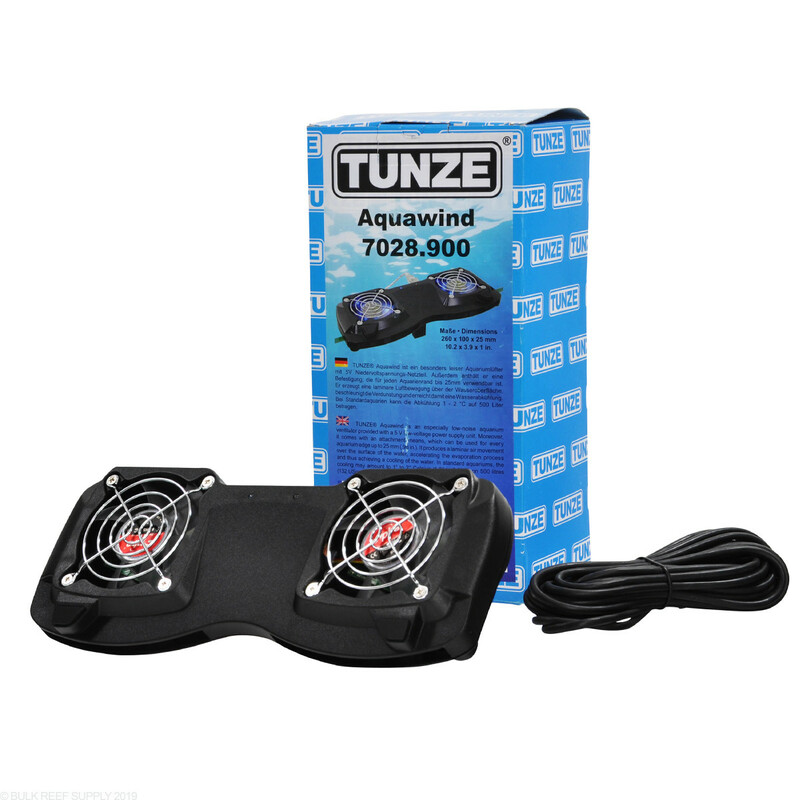 The Tunze Fans are very well built, low profile, & really quiet fans. I purchased 2 of them for my 180 gallon Saltwater Reef Tank, but I'm considering adding another due to the fact that I have a Canopy on my Tank. These fans work so far in this Florida weather, where everyday feels like it's summer.